Product placement has been around for a long time. Like, super-long. We tend to think of it in terms of movies and TV shows, but the truth is, the concept was in use well before the Lumière brothers were born. Perhaps the first notable use of product placement was in Jules Verne’s classic novel, Around the World in Eighty Days. As the story goes, when word got out about Verne working on a travel adventure, transportation and shipping companies started contacting him. There’s nothing to show that Verne was paid to use any of the actual companies mentioned in Around the World in Eighty Days, but the concept was born all the same. When we think of product placement, we tend to think of moments like the one in Wings: moments where it’s clear that the product, be it a candy bar or luxury car, is there for no other reason than to help cover the production cost of the movie. 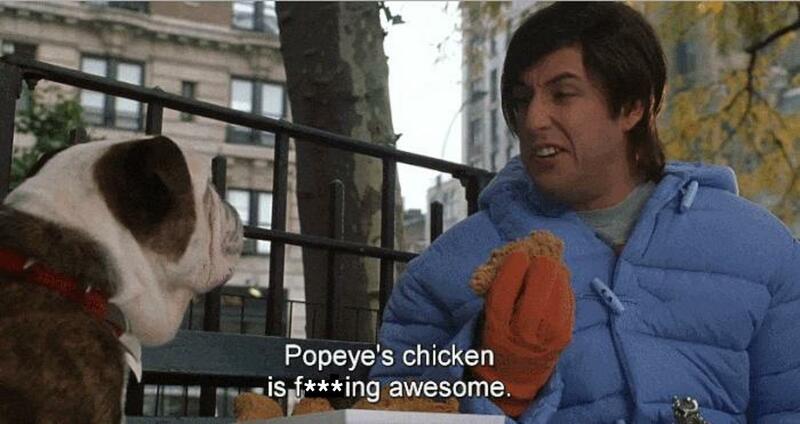 Sometimes we groan at these moments — think of the Popeye’s commercials in Little Nicky — no, it’s better to not think about Little Nicky at all. Well, just for a second think about it. Remember the scenes? There’s two of them and they are such obvious cash grabs that they hurt your soul a bit. We could spend all day looking at bad product placement, but that isn’t what we’re really here for. What about good product placement? What about when a product is used to push a story forward? Take what I think may be the best use of product placement ever done in film, Back to the Future. The BTTF films are chock-full of product placement, but each one serves a specific purpose to the story. For the purposes of this piece, I’m going to focus on the use of Pepsi, which has the biggest story arc in the movies (as much as product placement can have a story arc). Robert Zemekis has commented in the past that he and writer Bob Gale specifically chose Pepsi over Coca-Cola because the look of Pepsi had changed over the years while “a Coke bottle in the ‘50s and a Coke bottle in the ‘80s were the same.” For Back to the Future to work, the audience needed to see things they knew, and see how those things have changed over time. It’s impossible to grow up in America and not see a Pepsi bottle, so the look is instantly recognizable to the audience, and any changes to it will stand out. MARTY: Give me a Pepsi Free. The use of Pepsi quickly sets up that Marty is way out of his element. Later in the film, he can’t even figure out how to open one. The idea of using a bottle opener is foreign to the Future Boy. In Back to the Future II, when Marty travels to the future, we see more use of Pepsi to set up the changing times. The logo is futuristic, and once again, Marty can’t figure out how to open a bottle — only instead of being too antiquated, it’s too sophisticated for him. A recurring gag using a well-known product helps tell us the story in a way that a fictional one would have trouble conveying. There’s a secondary aspect to the use of Pepsi in BTTF that is my own theory: Marty is an underdog, and he drinks the underdog soda. Pepsi is always second to Coke, and Marty, with his low self-esteem and short stature, feels second to everyone else. Again, that’s my own theory based on watching Back to the Future more times than I can count. Sometimes product placement is used less to help tell the story, and more to help us connect to a character. I don’t know if there’s a better example than E.T. : The Extra Terrestrial. There are two products used to help us connect with the little bugger. The first, and best remembered, is Reese’s Pieces. E.T.’s love for those hard-shelled peanut butter candies didn’t just lift sales, it lifted our cynical hearts. Through a quick use of product placement, Spielberg and writer Melissa Mathison connected us to an animatronic puppet in a way that maybe shouldn’t work so well. Seeing E.T. eat something we all know, and enjoying it the way a child does, pushes us further into loving him, even if he is freaky-looking. The goal for product placement, from the point of the view of the companies that make the products, is to connect their materials to characters the audience wants to be like. That’s why there is so much product placement in the 007 series. James Bond, the coolest of the cool, is the ultimate salesman for high-end cars, drinks, clothes, and accessories, and his fans eat it up. One of the great examples of this is in GoldenEye, when James Bond drives a German sports car for the first time, the BMW Z3. BMW paid three million clams to get the world’s most famous spy into their car, and it paid off in spades. Before the Z3 hit the streets, BMW made $240 million in advance sales. A limited edition “007 Model” sold out almost instantly. 007 fans obsess over everything Bond wears. There are websites, like Bond Lifestyle, that break down every shirt, pair of pants, jacket, pair of glasses, watch, and anything else Jame Bond touches and where you can buy it. James Bond being a walking fashion magazine is something I only learned about recently, but I have to be honest, I am super impressed with the attention to detail these fans have. The amazing thing with the 007 films is how full of product placement they are, and how rarely it’s obvious. You don’t see Bond getting dressed and saying, “My word, this Ballantyne cashmere sweater is so comfortable” — which, I think, is why the Heineken deal in 2012 caused such a commotion. Heineken had been carefully placed into 007 films for well over a decade when they made a new deal in 2012. 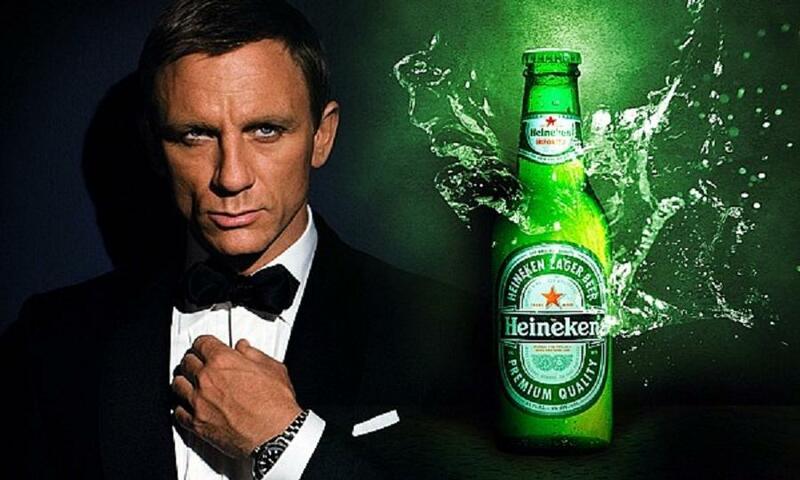 Bond was never shown drinking a Heineken, and the beer company wanted that changed. What’s more, they wanted Bond to show up in a commercial. Bond fans flipped out when they saw it — how could James forsake his famous vodka martini for such a common drink?! And how could he appear in an ad for Heineken! A scandal! Hiring blond-haired Daniel Craig and having Bond drive a Ford in Casino Royale had already put some fans on the offensive, and Heineken was the last straw. But apparently all was forgiven when audiences saw how good Casino Royale was. James Bond still pops up in Heineken ads, but no one really complains anymore. Product placement is a necessary evil. Movies are expensive, and studios want to do everything they can to make their money back. If Superman flying into an IHOP recoups a couple hundred grand, Warner Brothers is going to go for it. It’s up to the filmmakers to find a way to seamlessly integrate the products into the film. Sometimes they succeed. Sometimes they fail miserably. Sometimes they don’t even try (I’m looking at you, Adam Sandler!) and they just grab the cash. The important thing, for those of us who are watching, is to remember just how well it can be done, and hope that others learn from the masters. Derek Faraci lives in Farmington Hills, Mich., where the Pepsi is always free.